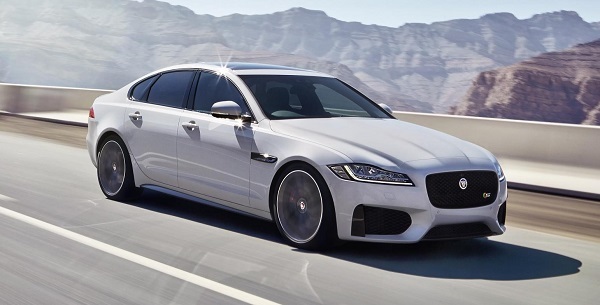 Jaguar has unveiled the next-generation, MY16 XF ahead of its UK launch in the autumn. The new XF will be lighter, better equipped and more economical than the outgoing model, with Jaguar’s new range of Ingenium diesel engines returning up to 70mpg. Like the XE and F-Type Coupe, the new XF is constructed from mostly aluminium, which means it weighs a considerable 190kg less than the outgoing model. Torsional stiffness has been increased by 28 per cent. The XF will use the same double-wishbone front suspension system as the F-Type, with aluminium suspension at the back, which should make it sharper in the corners with more grip and less body roll.. The XF is 7mm shorter than the old model, but will be bigger inside with a 51mm gain in wheelbase length. A 3.0-litre V6 twin-turbo diesel will be available, with 300PS and a colossal 700Nm of torque, fed through an optimised eight-speed automatic gearbox. The F-Type’s 3 .0-litre V6 supercharged petrol engine will be an option too, with 380PS and 450Nm of torque. Standard equipment has been improved over the old model and the XF now gets Jaguar’s All-Surface Progress Control, which will automatically manages the brakes and throttle control to improve traction in challenging weather conditions. 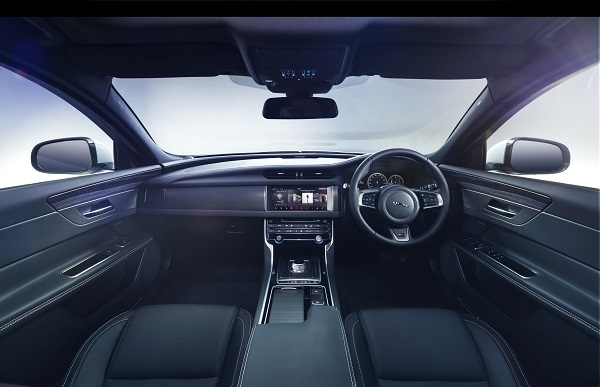 The interior has been improved and packed with tech; a large 10-inch touchscreen will be fitted as standard and feature dual view technology, which will allows the driver to use the navigation, while the front seat passenger will be able to watch TV or a DVD. A smartphone app will also be available, which will allow the driver to remotely heat and cool the cabin. There are no details on pricing yet, but expect the XF saloon to arrive in September, with an estate version following early 2016. However, in the meantime, Jaguar gave the public a first glimpse of the new XF by driving one across the Royal Victoria Dock in London’s Canary Wharf on a pair of high wires, breaking a world record in the process. AROnline readers can view the video of the dramatic stunt below. 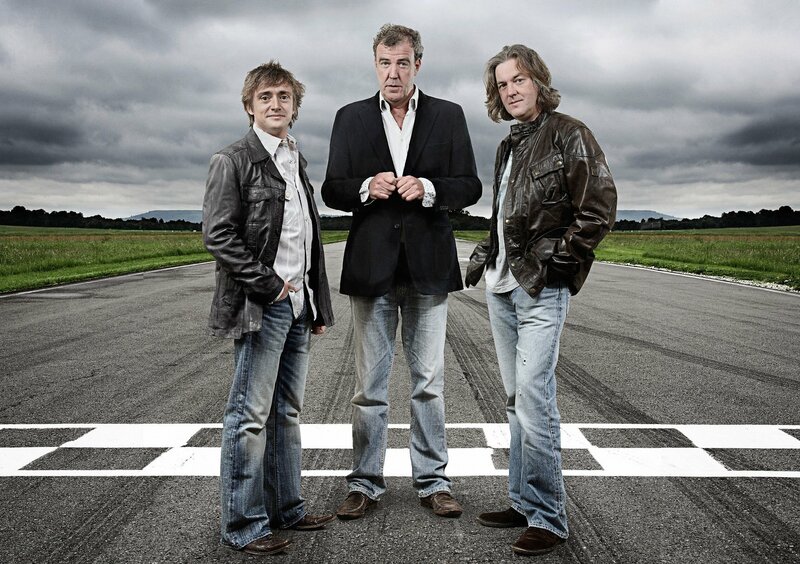 Blog : Clarkson – has the BBC Terminator reached its Judgment Day? But is it competitive with what this market wants? So far “proper” Jags have got nowhere sales wise. With this car and the XE Jaguar seem to be very carefully targeting and positioning their cars at the heart of the premium/Exec market. That con only be a good thing if they actually want to sell cars rather than impress a dwindling group of brand aficionados. Well, I’m an aficionado, owning one of the last traditional-style saloons, an aluminium XJ6, (all aluminium, too, no steel panels anywhere !!). However, I have to agree with Paul. we are getting old and grumpy, and Jaguar need to move on as they already have with the previous XF, and the current XJ. I find the new XE looking attractive as an ownership proposition but the old style does get me a bit nostalgic, albeit the fuel costs were always eye-watering !! Hi Fraser, I think that the XJ6 you own has future classic written all over it: traditional Jag looks with modern technology underneath. What’s not to like? May I ask, is it an X350, or the facelifted X358? (Personally, I prefer the more classic look of the former, but both are great cars.) Haging said that, I really like the look of the new XF even if, like Antigoon above, my first impression was that the six-light glazing is a dead ringer for the mid 90’s Euro spec Honda Accord! What was done to the original, lovely, “X350” when it was “face lifted” as the “X358”, really did produce a “pig’s ear” from a “silk purse” . . . I agree that although very attractive it is not unique in way a Jaguar used to be. The interior in particular is “what make is that?” rather than “looks like a Jag”. Still a great car though and what today’s buyer wants. Up to 70mpg – incredible!! The exterior looks good, though I was expecting something “new” rather than a restyled XE. But the interior is simply tasteless!!! It has absolutely no personality, where are the wood and the aluminium that we used to see in the Jag’s? Not to mention that the switches under the screen look cheap. Despite all the car stills looks good and is innovative (aluminium frame and Ingenium engines), so I think this car will give JLR the chance to compete with the German premium saloons. The wood and aluminium is absent from the car in the photograph because it is an S model, just as it is absent from sports versions of the current car. No doubt in other trims the G-Plan and Stressless recliner look will still be available for those that want it. I was just before reading this saying to a Swedish guy talking about developments in Swedish and UK industry. 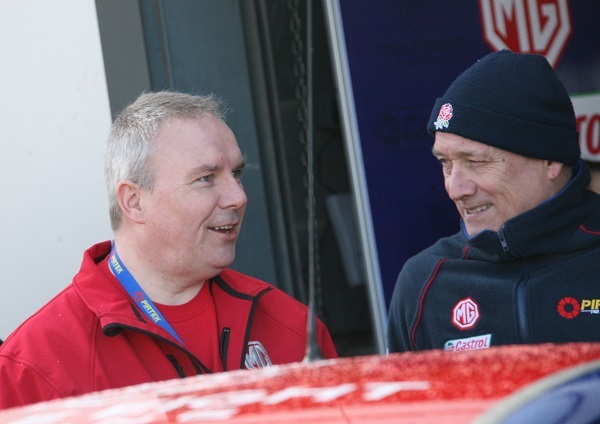 I said “I could never have imagined that Tata would be so good at running Jaguar Land Rover”. Looking at this car, I suspect the first clear class leading saloon from Jaguar since the XJ6/12, I am even more impressed by Tata. Also message to Unite Union Leadership, you try to destroy the opportunity this car offers for Jaguar Land Rover and its employees, the way the Unions all but nearly destroyed the original XJ6/12; you should never (ever) be forgiven. I think it was a bit behind its German rivals in space and economy, a legacy of being based on an older platform. Impressed with the exterior styling, it manages to look like an XF, but new. Interesting that the XE is four-light, whereas the XF is now six-light. Just like the Rover 600 and Rover 800! The old XF was also an 8 year old design, by far the oldest car in its class. I think the outgoing XF is good, but I think it would be hard to say that it dominated its class certainly nothing like the way the original XJ series 1 & 2 lead the world at the time. looking at what has been done with the F type, this car has the ability to do what the XJ did. Perhaps what Tata did was to let Jaguar run itself. Interior is a bit drab. Looks like a Japanese clone. To be fair though, I quite like the outside. As for 70mpg, maybe in a laboratory with the doors taped, the mirrors removed and the radiator blanked off but not in the real world. @ Tony Evans, real world economy figures never match those the manufacturer creates in a laboratory. However, 70 mpg and a Jaguar would have been something to really laugh at in the eighties, when an XJ 6 would struggle to get 22 mpg on a slow run in the country. 50 mpg is more realistic and quite an achievement. As much as they probably won’t admit it BMW/Mercedes/Audi etc are now mass volume sellers trying to maintain a premium high end “exclusive”feel about them. I think Jaguar cars are the only car manufacturer I would consider to be still unique in that respect. Incidently it’s good to see Jaguar are back investing into its home town – Coventry back where it belongs. You have got to hand it to Tata they are not doing a bad job. I think everybody at BMW Steyr will smile about that 2 litre engine. 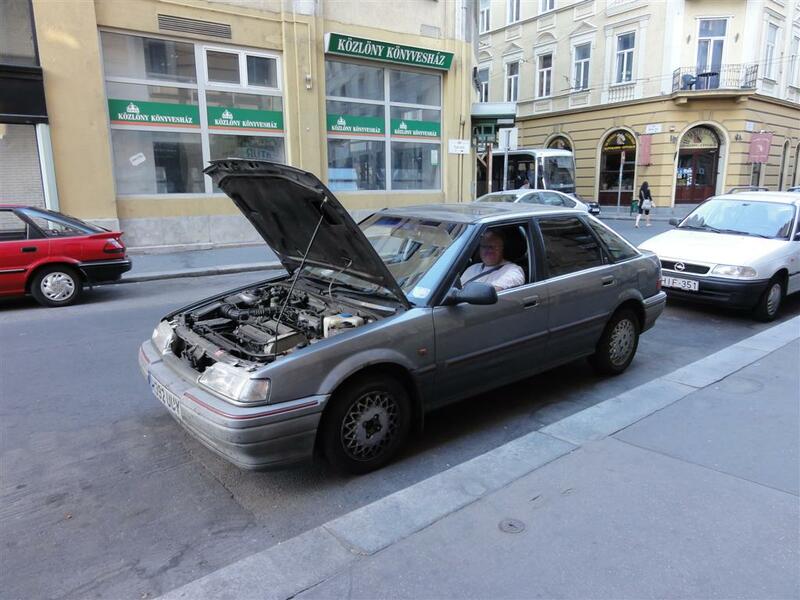 No power, less torque than all the engines of the copetitors and what about high end petrol engines? I do not think that you could get customers in Asia with a Diesel engine. BMW will now finish the new 3 litre Diesel six cylinder engine which will be nearly as economical as that engine but with twice as much power as that two litre four cylinder. PS. : If you put a big L on the new XF it could be a Lexus too. That´s not a styling which would be ok for a Jaguar. It looks like a chinese copy of a japanese car. No doubt for other markets there will be other engines, just as there are now. Performance of the Injenium, despite what the numbers say seems competitive with anything BMW offers if road tests of the XE is anything to go by. Top Trump credentials mean zip on the road. Umm. BMW offer 2 litre diesel engines in the 5 series across Europe. Jaguar will offer a range of engines across different markets depending on what those people buy. 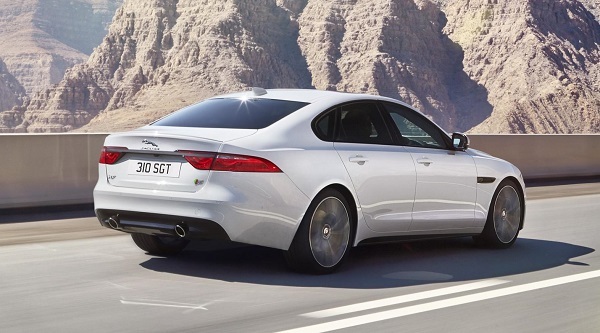 The existing XF is offered with petrol engines and four wheel drive in the USA. You couldn’t get those in the UK. And will people stop banging on about it not looking like a Jaguar. Just because Jaguar styling got stuck in a rut for 40 years doesn’t mean they should stay in the rut. I like the new Jaguar styling. It’s really clean and pure, without all those extra folds that seem to be added artifically to make cars look different. Attractive styling although it is rather like a number of volume cars, particularly the Mazda 6 (apart from the grill). Unfortunately the interior looks truly horrible. A black hell hole. Are you listening Jaguar – there are customers who are able to look beyond the generic german-design car and want something different from black on every interior surface. it looks amazing, a clear link to the XF but totally up to date. the devil is i n the detail on this car and i think it looks really special. moden and forward thinking, just what a jag is meant to be. i dont think there is anything else like this in its class. although i admit the interior could be better. but once again look closer. with a little bit of cream and wood and its going to be great!! i want one! 1. The Porsche 911 idea did not work for Jaguar. They tried that with the XJ6 and the design became a turn-off for buyers. They were sick of the 1960’s design being updated. It works for Porsche, but it stopped working for Jaguar. 2. The Porsche idea of stretching their basic design shape to fit anything (Boxster, Cayman, Macan, Panamera, Cayenne) didn’t work for Jaguar either. The X-type was a flop. 3. The constantly raiding the heritage back catalogue look didn’t work either. The S-type didn’t sell well enough and it looks awful now. Far more dated than a Rover 75 which was launched at the same time. 4. Jaguar now need to build a brand identity. Mercedes, BMW, Audi are the competitors and there is a definite brand identity among them all. You can tell it is an Audi, whether it is an A1 or a Q7. The same between a BMW and and i8. The same between a C-class and an S-Class. They have a design language. Jaguar’s research has told them that they do not. The car is not instantly recognisable as a Jaguar, unlike Audi etc. That is what Jaguar are working on and so the new XE and the new XF cannot look totally different from the original XF, because they will never build a brand identity by doing that. They need to build on the original XF and get the new Jaguar design clues into the public’s mind, to build familiarity. That is the purpose of the new XE and XF. 5. A radical design will not work in the classes in which they want to enter or expand. BMW tried that with Mr Bangle and his “flame surfacing” designs on the Z4, the 5 and 7 series, but not on the 3 series of the time if you remember. Where is the “flame surfacing” radical now? Where is he now? Why was he not allowed to “flame surface” a 3 series? How conservative are the current 3 and 5 series, the A4 and A6? The C class and the E class? Why? Because the market wants conservative. The Jaguar design themes are already pretty radical. They have the coupe look even though the car is a saloon. Which looks the most dull and boring? The original XF or the current 3 series? Anyone really say XF? 6. Jaguar are entering the fierce 3 series market and also want to expand their sales in the 5 series market and what they have designed is perfect for those markets. I knew the current XF was coming to the end of its life, but I didn’t realise that its replacement was ready. Then I read it won’t be available until September and the estate next year! It seems ages since the XE was launched and I’m wondering whether its replacement will be previewed before the current model gets to the market! I can’t believe the current XF is due to be replaced this year, despite its age, as it still looks remarkably fresh and engaging. The facelift cars from approximately 2013 made it look even more imposing, particularly those sleeker headlamps. The new XF carries this on with vigour although as with the XE, the issue I have lies with the styling of the rear-end. Okay, so the rear-end of the new XF does have a little more distinction than that of the smaller, more anonymous looking XE. But those tail-lamps and boot-lid applique panel still remind me of a 1990’s Seat Toledo. Based on an artist’s impression I saw in a car magazine about three months ago, I was hoping to see something more dramatic with the tail-light treatment, such as along the lines of the current F Type or even the lovely boomerang design of an early Maserati 3200 GT. Instead it seems the interest lies solely with the detail of the lighting’s LED arrangement, rather like on a Volkswagen Golf. The facelift actually took place 4 years ago in April 2011. Thanks for this, Paul. I was working from recollection rather than from a press release or article. The age of that facelift highlights how well it has worked in terms of keeping the XF looking fresh. My experience of the XF till now has been truly superb. I used not pay much attention to all those customer surveys but they have it right. Jaguars of late are simply the best built in their class. Other than XFs loving to eat brake discs, they are proving to be the best built and most reliable of all the cars in its class that I am reponsible for maintaining. Hope Jaguar continue the quality with new XF. Nice cars as they are the C-Class, 5 series and A4/A5/A6 are not as great in terms of quality as they are made out to be. As for the 3 series, E-Class and A7 I refuse to recomend them. Copying the German generic designs of five years ago and giving up brand identity in the process. Stupid mistake to make – typical short sighted British management. What’s going to happen now? I’ll tell you. The Germans will up their game in terms of interior ambience and luxury (Mercedes already starting to do this) and will move away from bland exteriors. The mass market brands such as VW and Ford will release more externally attractive and distinctive cars with better quality interiors in a bid to try to steal sales back from the premium manufacturers. Then Tesla will release their Model III which will be good looking, luxurious and ground-breaking. Meanwhile, Jaguar’s conservative and slightly bland XE and XF will be sitting there as mid-life models looking increasingly unattractive against a rapidly changing market with buyers who are becoming more discerning with time. They will then wish they had been bolder and perhaps hung on to some of their design cues instead of throwing the baby out with the bath water. What will make this even sadder is they will have proven they could design a modern, yet still distinctively Jaguar car that sells with the XF and F-Type. Very little design flair on the sedan Jaguars these days but from an engineering standpoint, they are getting much better. I’d like to see more work on electric powertrains though using help from Tesla. Either all electric or using that ingenium engine. Diesel Nox must be brought under control in our towns and cities. UK Supreme Court ruling re failure to curb terrible air quality due to diesel vehicle exhaust emissions.